Butterfly Gaura are shrubby, perennial wildflowers that are closely related to the Evening Primrose. From late spring until first frost, they produce 8"-24" spikes of flowers standing above the foliage. The 1" flowers are white when they open at dawn and fade to rose-pink as the sun sets. Other hybrid varieties have light pink to bright pink flowers. and spent flowers drop off by themselves after their day of blooming. 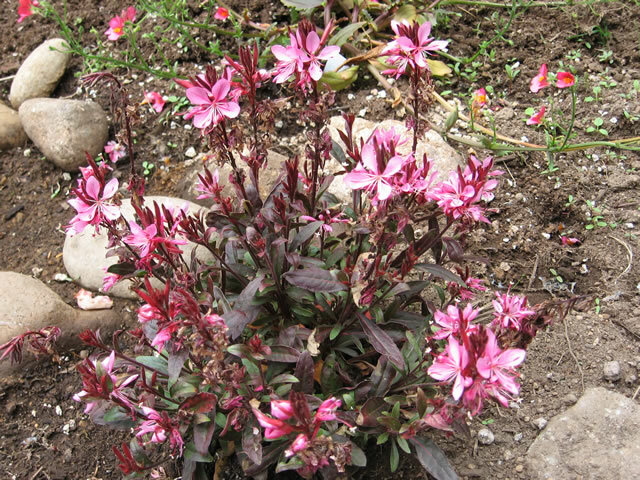 Butterfly Gaura plants may grow up to 2-4 ft. tall and 2-3 ft. wide. Butterfly Gaura are hardy in USDA zones 5-10, but grow best in hot, dry climates. especially in the heat of the afternoon. before planting your Gauras 10-12" apart in loose, light, well draining soil. Water regularly and thoroughly during the first growing season, to establish a healthy root system. 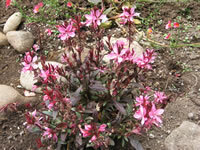 Once established, Butterfly Gaura are very drought tolerant plants. Feed once in early spring, before new growth begins, with a good all-purpose fertilizer. When flowering declines in mid summer, cut the plant back to about 3"
to induce re-growth and a second session of blooming in the fall. Provide a winter mulch in areas colder than zone 7. It is possible to divide Gaura plants in the spring, but established plants are very difficult to dig up, so this method is not recommended. Basal cuttings from side shoots taken from the base of the plant as they emerge in late spring. Tip cuttings can be struck in early to mid summer. Butterfly Gaura self seed readily, so this can be a source of new plants, or seeds can be collected and sown in the garden in early spring or in the fall.